Marc-Oliver Pahl | The 2nd Smart Space workshop in cooperation with Intel Edison takes place Nov 21, 2014. Come! On this page you find an alphabetic list of all speakers. The S2O workshop is about making smart spaces become reality. In fact, smart spaces are reality already in research labs. In the 10 o’clock slot, you have the chance to get to know about such smart spaces that are currently reality in research. Ten experts will tell you their different perspectives. In this talk I would like to introduce the BaaS Model House to you. It is a small scale physical building model including a lot of building automation technology. We build this model along the research done in the BaaS project and want to reflect the results in it. Some of the problems occurring whilst developing building automation systems is the great effort testing the developed services, need of infrastructure and impact on the building usage. With the BaaS Model House we create a clear and easy to overview test environment we can use for demonstration and presentation of building automation systems. Finally we want to be able to develop building automation services tested on the model and deploy them in houses equipped with automation technologies. Therefore we integrate and use building automation hardware and technologies resulting in realistic behavior of the running system. Get ready for further insights and the current state of our approach. Malte Burkert is a staff member at the chair for practical informatics at Technische Universität Dortmund. His main interest are distributed reliable systems with focus on model based development and technical management. In this talk the Smart Energy Living lab at fortiss will be introduced. This demonstrator is integrated in a real office environment which represents a node of the future smart grid. The current implementation supports various device classes from different kinds of energy technology like solar panels, batteries, smart meters, actuators and sensors using different protocols. The demonstrator system is used to monitor, control, and manage the office environment as well as to store signals and data from every connected device. Furthermore, a rule system is applied to support autonomous behavior and increase the energy savings. In addition, mobile applications and corresponding interfaces are developed to interact with the system. The Smart Energy Living Lab provides a basis for further research directions, which deal among others with the collection of sensor data, the analysis and forecast of production/consumption values, the creation of energy awareness, as well as the interconnection and interaction with other Smart Grid Nodes including energy related services. Dr. Markus Duchon finished his PhD in 2013 in the area of Mobile and Distributed Systems at the Ludwig-Maximilians-University of Munich in cooperation with Siemens Corporate Technology. There he worked in the Department of Software Architectures and Platforms. His research interests include methods for optimizing Distributed Systems, Context-sensitive Systems and Software Architectures for the Smart Grid. At fortiss he is, among others responsible for the Smart Energy Living Lab Demonstrator. The talk will be about demand and response energy control. Sunil K. Ghai is a research software engineer in the Smarter Energy group at IBM Research India. His research interests are in applied machine learning and systems development. At IBM, he works on problems pertaining to energy efficiency in residential and commercial buildings. He won a best paper award at IEEE E6, 2012 and his paper was nominated for a best paper award at ACM e-Energy 2013. He has also worked on an EU FP7 project (Wattalyst), where IBM is a consortium partner. Before joining IBM, he interned at the Technical University of Munich, Germany in 2009 and 2010 with The Chair for Network Architectures and Services group. He also worked with Google Inc. as a Google Summer of Code student in 2008 and 2010. He received his Bachelor’s degree in May 2010, from the Delhi College of Engineering, Delhi, India. 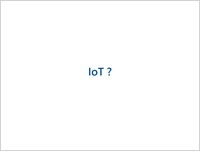 Internet of Things : I love it, I even have an idea for a product. But how do I start developing a prototype ? And how to go from a prototype to a production batch ? That’s the problem IoT developers are facing today. It’s part embedded computing, part electronics, part software and you can’t be expert in everything. There’s plenty of platforms available, from Raspberry Pi to Arduino, but they all have different capabilities and features. It’s hard to choose. Plus, most of them are not convenient to put into production. So, why not start with Intel Edison ? It’s very small, works with USB power, has wifi and Bluetooth 4. It’s a linux PC so it’s easy to work with. But there’s a microcontroller inside too. Sounds interesting ? Come with us to code on Galileo and Edison ! Paul is Intel Software Academic Program – Manager for EMEA-Russia. They are developing technical collaborations between intel and academic institutions. In my talk I will present one of the wearable projects I have developed so far: a smart jacket that supports blue collar workers during maintenance activities. I will also present a tool I created for the visual programming of smart textiles. Juan Haladjian is a research assistant at the Chair for Applied Software Engineering at the TUM. He studied computer science in Barcelona and Computational Science and Engineering at the TUM. His research focus is on eTextiles and in particular, on ways to enable end-users to create software for their eTextiles. The talk will be about smart spaces we are currently planning at our TUM living lab. Benjammin is a staff member at the chair for network architectures and services at Technische Universität München. 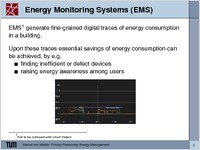 In smart buildings a multitude of sensors measures the state of the building and its usage by the inhabitants. These information are collected at different places and at a time when it might be still unclear where these information will be analysed. It is therefore insufficient to imagine a centralized database for the storage of the information. Data streams are rather sent around and parts of it stored at different and/or multiple places. As a consequence, access control cannot rely on a database management system or a broker component but must be inherent to the data streams itself. We present a solution to this problem which uses attribute based encryption to protect data streams and enforce access control on the data level. Marcel studied Computer Sciences and Media at the Ludwigs-Maximilians-Universität in Munich. He is now a research staff member at the chair of network architectures and services at the Technische Universität München. His research interests are the creation of privacy preserving systems and strategies of data protection. This presentation will give a short overview of problems and challenges in building automation systems of today. The BaaS Semantic Service Platform aims at facilitating the development, engineering, commissioning and operation of innovative value-added building services along their lifecycle. The lifecycle support for services offered by the BaaS platform will be illustrated by means of a simple use case on monitoring of heating efficiency in buildings. Jelena Mitic is a research scientist in the field of Internet of Things at Siemens Corporate Technology, the competence center for technology and innovation at Siemens. Mitic has 10 years of experience in the area of pervasive computing, distributed systems, software architectures and platforms. She received her B.Sc in Electrical Engineering from University of Nis, Serbia and M.Sc in Communications and Media Engineering from University of Applied Sciences Offenburg, Germany. In the research project BaaS TWT develops mechanisms to reduce the energy consumption of shared spaces. As HVAC (Heating, Ventilation, Air-Conditioning) is one of the largest contributor to the overall energy consumption of buildings, our goal is to develop a proactive temperature control schema for shared spaces (e.g. meeting rooms) taking into account user-preferences, the room geometry, the outside temperature, as well as historical data. In this talk we give a first insight into our concept for using sensor fusion, information processing and domain-specific optimization algorithms in our planned demonstrator. Dr. Andreas Müller received his diploma degree in computer science from the University of Tübingen in 2007 and his doctoral degree from the Technical University of Munich in 2013. Since 2013 he is employed as a Research Manager at TWT and works on projects in the area of electro mobility, building automation and future Internet. From 2008 till 2013 Dr. Müller was a research staff member at the chair for “Network Architectures and Services” at the TU Munich where he worked on novel network architectures, network virtualization and network security. In the first talk I will give you a brief dive into smart space research. In the demo session I will show you why smart rooms enable much more flexible use than non-smart rooms. At the example of a meeting room we show how space orchestration via software enables a dynamic reconfiguration of a room. Positive effects of such flexible usage are increased comfort and a reduced energy footprint. Marc-Oliver leads the smart space research at the chair for network architectures and services at Technische Universität München. He is working on an operating system for future smart spaces for several years. His research vision is making Pervasive Computing become as ordinary for people as Mobile Computing managed to become. Marc-Oliver is responsible for the practical networking hands-on experience of more than 1500 students so far. He received multiple awards for his teaching. Marc-Oliver studied informatics in Tübingen with emphasis on computer graphics, computer networks, and media science. After his diploma he joined Technische Universität München. In 2014 he finished his PhD on distributed smart space orchestration. Recent developments in smart home and smart office controls tend to lock the occupants out of the system on the assumption that they will make errors or lose interest in controlling their environment. I assume that providing an intuitively usable control is crucial to comfort, well being and energy efficiency. In this presentation, I will present my research around the intuitive control of smart spaces including gesture controls and iPhones. Sebastian Peters is IT consultant for innovation technologies at Capgemini and part-time Ph. D. student at the Chair for Applied Software Engineering, TU München. His research focusses on providing a framework for the intuitive control of smart environments. He holds a Bachelor degree from Universität Paderborn and a Master degree from Technische Universität München.